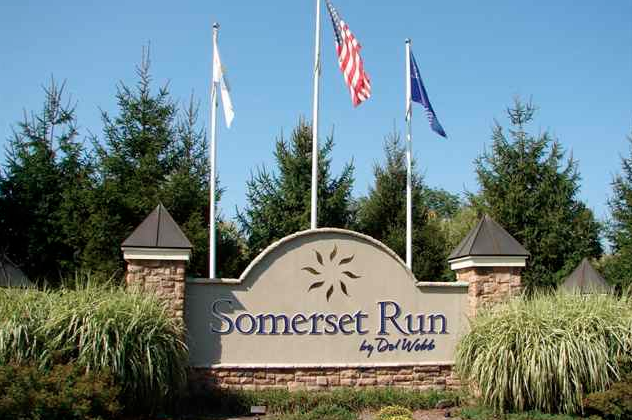 Somerset Run is a gated community of 755 elegant ranch homes in historic Somerset County, New Jersey. With a scenic suburban setting, Somerset Run is a lovely active adult community nestled in the heart of Central New Jersey. Its picturesque rolling hills and lush landscaping provide a tranquil retreat, while its easy access to nearby shopping, dining, and other facilities make Somerset Run a great destination for active adult retirees. Built between 2004 and 2006, Somerset Run is a Del Webb community designed to meet the needs of active adults. Its single-family and attached homes cover a range of sizes and prices. Construction has been completed, but interested homebuyers can choose from the community’s available resale homes. Somerset Run’s 264 affordable carriage homes are one-level condos arranged in three-story buildings with elevators and garage parking. These two-bedroom homes range in size from 1,780 to 1,900 square feet. Homebuyers who prefer single-family homes can find two- or three-bedroom resale homes ranging from 2,200 to 3,100 square feet. There are a total of 491 single-family homes in Somerset Run, and each has its own attached two-car garage. Beyond its distinguished homes, Somerset Run offers resort-style amenities through Stone Manor, its impressive 25,000 square-foot clubhouse. Stone Manor provides residents with a wide range of amenities, including hobby and game rooms, an arts and crafts studio, a business center and ample space for socializing. Stone Manor’s large ballroom is ideal for many different community events and multipurpose meeting rooms support club meetings and other activities. The lounge is a cozy area with large windows and a two-story fireplace, and the library is a quiet place for residents to curl up with a good book. Fitness-minded residents have several ways to stay in shape. The state-of-the-art fitness center features cardiovascular and strength-training equipment. It includes a heated indoor swimming pool, sauna and whirlpool spa, as well as private massage rooms. Outside, Somerset Run residents can enjoy a variety of amenities and activities. The outdoor swimming pool is surrounded by a spacious sundeck with shaded areas, lounge chairs and patio tables for dining al fresco. Residents can join a game of tennis, bocce ball or shuffleboard, or sharpen their skills at the well-maintained putting green. For active adults, Somerset Run is a lovely community with friendly neighbors, affordable homes and impressive amenities. Its location in Central New Jersey offers easy access to nearby retail centers and other services, while letting residents enjoy a climate with all four seasons. With so much to offer, it’s easy to see why Somerset Run is a hit with many active adult homebuyers.